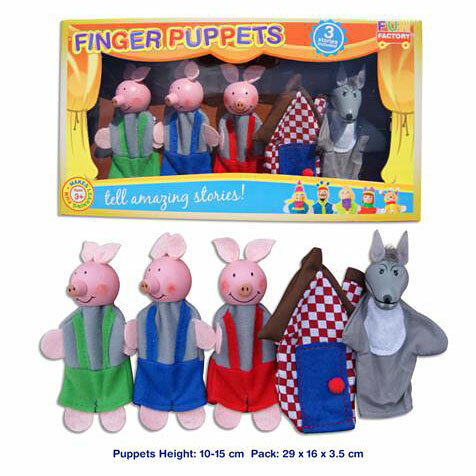 Your child will delight in storytelling with finger puppets based on the well-known children's tale of The Three Little Pigs. The three pigs are each wearing different coloured overalls so the storyteller and audience can easily keep track of which character is which. Three stories are included for extra inspiration and the box packaging can be used as your own mini portable theatre. Children adore putting on shows for a little audience, and the finger puppets provide additional elements of challenge and excitement. They'll also love watching adults creating more complex, interactive stories using their finger puppets! 3 Pigs, Wolf & House in cardboard box. Each puppet measures approx. 10cm - 15cm.